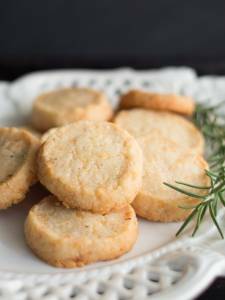 These cookies will melt in your mouth and are easy on blood sugar levels!!! Can’t ask for more than that of a cookie. Toast hazelnuts in a sauté pan over med-high heat for about 5 minutes, tossing/turning the nuts frequently. Let cool while you combine the dry ingredients in a large mixing bowl. And the wet ingredients in a smaller bowl. Coarsely chop the cooled hazelnuts and add to the dry mixture and toss. Make two 1 1/2 inch in diameter rolls by putting half of cookie dough on edge of parchment paper. Roll parchment paper over the dough a few times gently molding the dough into a 8-10 inch tootsie roll. Repeat. Chill the dough in the freezer for 1 hour. Preheat the oven to 350 ten minutes before removing dough from freezer. Remove dough from freezer, remove from parchment paper and slice into ½ inch chunks. Place cookies on parchment lined cookie sheet and bake at 350 for 7-10 minutes.